Get Everything You Need. Save Time and Money. GoBox is a small box that is filled with things international students and travelers need when coming to San Diego. We provide packages filled with everything from SIM Cards to Sunscreen. The Go-Box $75 package is valued at over $115 with products, gift cards, and coupons. We do this so you can save time and money getting the small things you need so you can ultimately make the most out of your short stay. Check out GoBox packages here! Go-Box Provides you with the products you need when coming to San Diego as a student or traveler. This allows you to easily spend more time and money on exploring San Diego instead of shopping for the simple things you need. AND the best part about our Basic Package is that we give you everything for the price of a sim card and one month data plan. Learn more here! We are travelers that love to host other travelers. 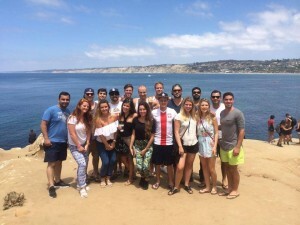 We saw that International Students and Travelers could be making more out of their time in San Diego. We developed a product that combines all the essential things you need plus make it easier to do things like buy groceries, pick a good quality sunscreen, find a yoga studio…. Join our family of travelers!